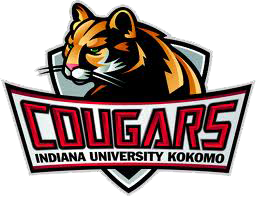 BEREA, Ky. – The Indiana University Kokomo volleyball team hit the hardwood this weekend for two matches and came away with two hard fought wins. The Cougars defeated Tennessee Wesleyan and Berea College to improve their record to 4-0. In the second match of the day IU Kokomo defeated host Berea College in four sets (21-25, 25-20, 25-11, 30-28). The highlight of the match was the clinching fourth set that saw the team’s trade points until the Cougars were able to secure the win. Captain Lael Burrus set the tone with her defense, accumulating 16 digs. After having a negative hitting percentage for the first set, the offense was able to get things going for the rest of the match by hitting .229 for the final 3 sets. Hayes was pleased to get the win, but knows there is room for improvement. “We give away too many free points with unforced errors but I believe we will find consistency as the season progresses,” Hayes said. The Cougars will be back in action on Thursday, August 29 at 4:00 p.m. against Point Park University. For more information on IU Kokomo Athletics contact Tyler McClure and tymcclur@iuk.edu, visit our website (IUKcougars.com), or follow us on Twitter @IUKathletics. This entry was posted in IU Kokomo, Volleyball. Bookmark the permalink.